PappaRich, a Malaysian restaurant franchise, is burning a path across Australia with 15 branches across 4 states and counting. Their very enthusiastic ambassador is Poh Ling-Yeow, Masterchef Season 1 runner-up (and whom I believe, along with many other viewers, should have been the winner). I’m a staunch believer that any success for a Malaysian restaurant is a success for Malaysian cuisine, but then again, as a typical Malaysian, we are the harshest critic when it comes to the delivery. PappaRich has also hit the news for the wrong reasons. The Broadway branch in Sydney has been accused of student exploitation, paying former Malaysian student staff under the legal entitlement and withholding penalty rates and superannuation. The matter is with the courts. I have never had PappaRich back in Malaysia, as they are a West Malaysian franchise. This was my first experience of their menu. I had read several reviews which waxed lyrical about the taste of their dishes, and was keen to check them out. PappaRich is popular; our first visit to the Chatswood branch (nearest to us) at 6:30pm on a Thursday had us standing in a long queue. We only got a table after 15 minutes because there was two of us, larger groups had to cool their feet for longer. The ordering system at PappaRich consists of a order chit and a electronic button on the cutlery tray. Once you have made your selections on the chit, you summon a staff member with the green button who whips it away and returns with a printed receipt. As each dish is brought the to the table, the server marks it off the receipt. Clever. 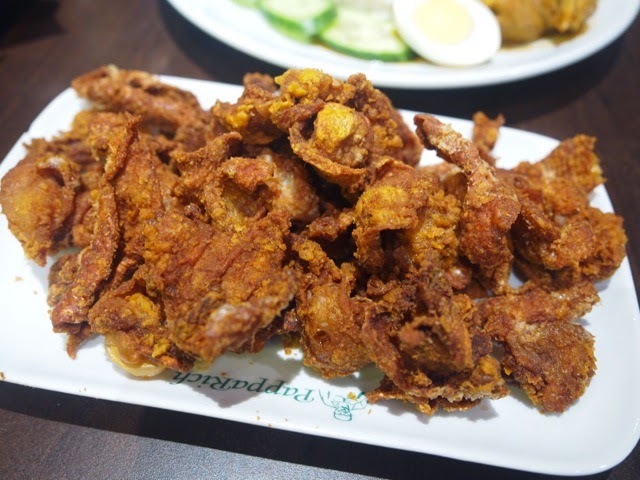 We had to try the famous deep-fried chicken skin snack. This could have been great, but on the day, the morsels seemed overcooked, they tasted dry and burnt. 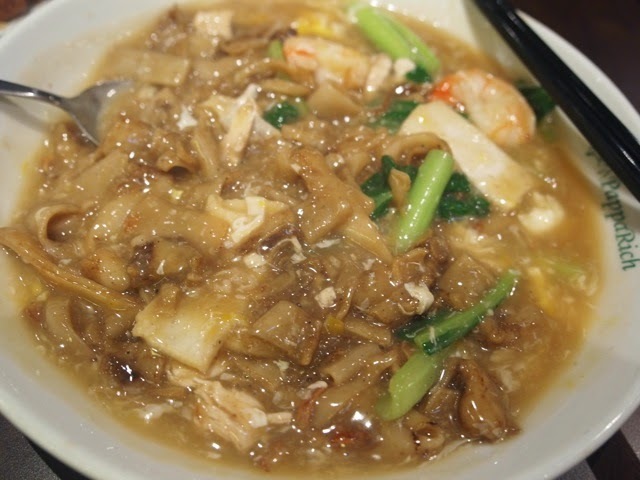 The wat tan hor (rice noodles in gravy) came in a generous size. Could have done with more protein, but overall this was quite tasty. The noodles had a good bite, the gravy was thick and flavoursome. 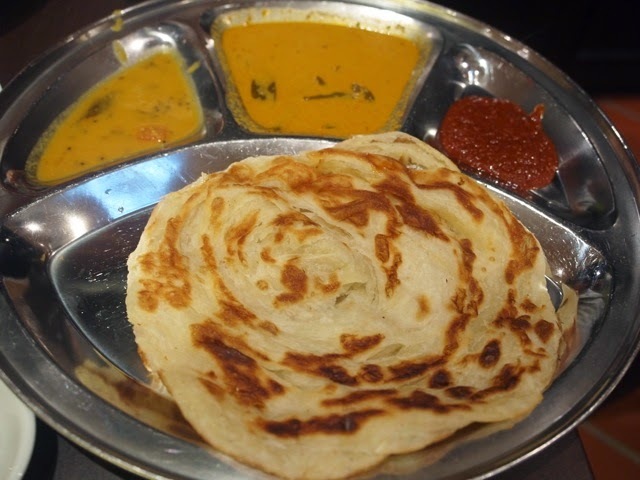 The roti canai was soft and chewy, but didn’t have the crisp and fluffiness that the Mamak version has. The dhal was also pretty ordinary. The nasi lemak with curry chicken and prawn sambal was rather toned down in flavour. BL felt the sambal was lacking in real spice kick. 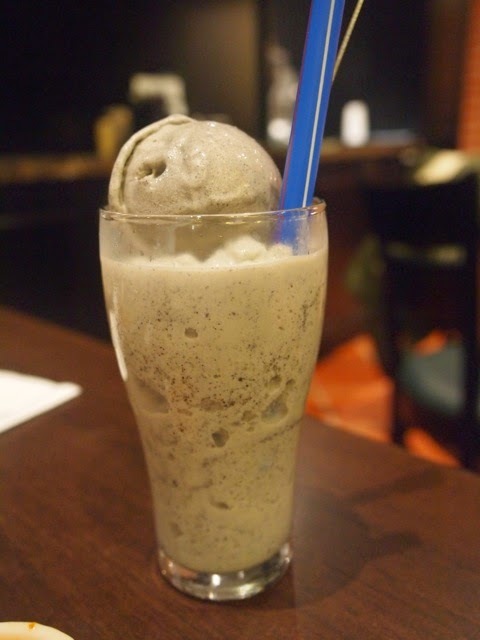 I had the open sesame, a dessert/drink made with black sesame powder and soy milk topped with a large scoop of black sesame ice-cream. This was one tasty, decadent treat. 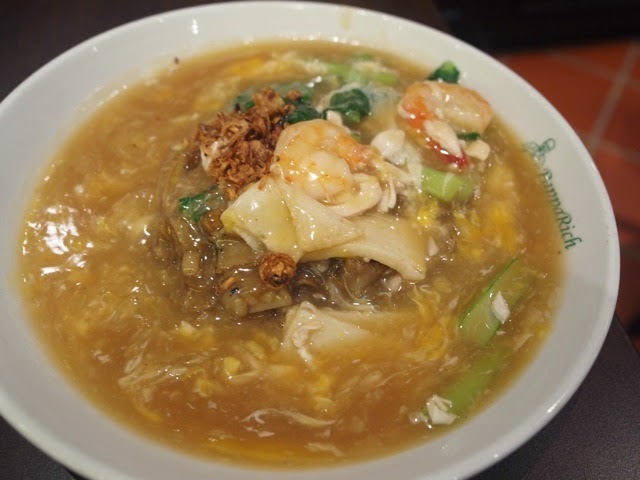 Our second visit was for a quick early meal before the movie, and decided to try several other dishes. At 5pm on a Saturday, there was no queue, but there was enough early diners for a brisk business. 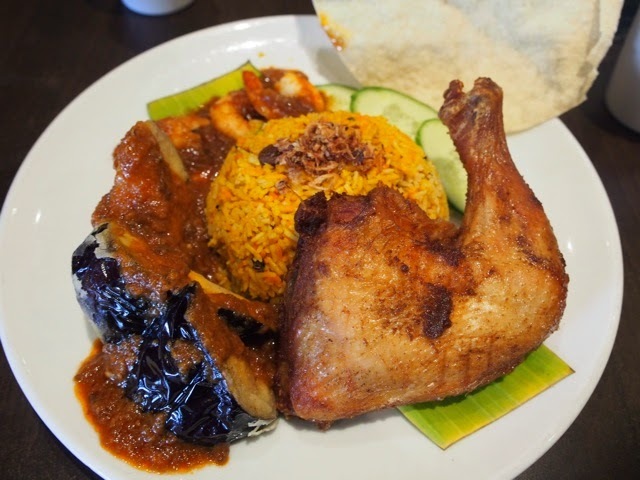 The crispy chicken biryani is a smorgasbord of chicken, deep-fried eggplant and prawns with sambal sauce. It was tricky eating the chicken without a knife; I think the idea might have been to use your fingers. The biryani rice was flavoursome but dry. Adding sambal sauce to the rice helped. I liked their satay. Good flavour, nicely grilled. The peanut sauce was rich and had a good chunky texture. The ABC (which stands for air batu campur, or mixed ice dessert) was such an epic fail, no Malaysian would call this monstrosity our own. 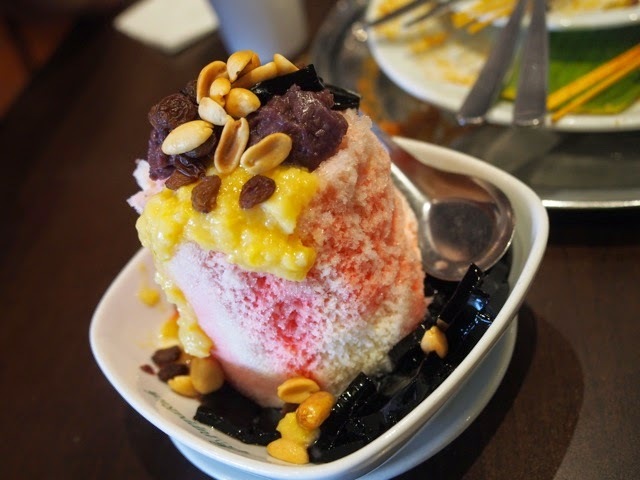 It bore scant resemblance to the photo in the menu; the ice was hard, the cin cau (grass jelly) were in too-large chunks, there was too much grenadine syrup, whole peanuts (West Malaysians use crumbed peanuts, East Malaysians do not use peanuts) and raisins. Seriously. No. Malaysians never put raisins in ice kacang, and the taste clashed with the other ingredients. I am confused why PappaRich is so popular, and I think it’s mainly to do with comfort and convenience (branches are opened throughout the day, and there are a lot of menu options). 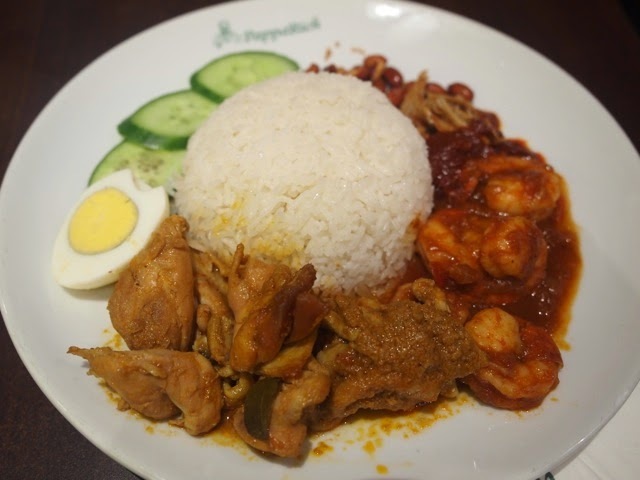 Yes, there are more authentic versions (there is a Mamak branch in Chatswood, and Ipoh Club has just opened at the Chatswood RSL), but PappaRich is the closest to a comfortable restaurant experience than a hawker store fit out. 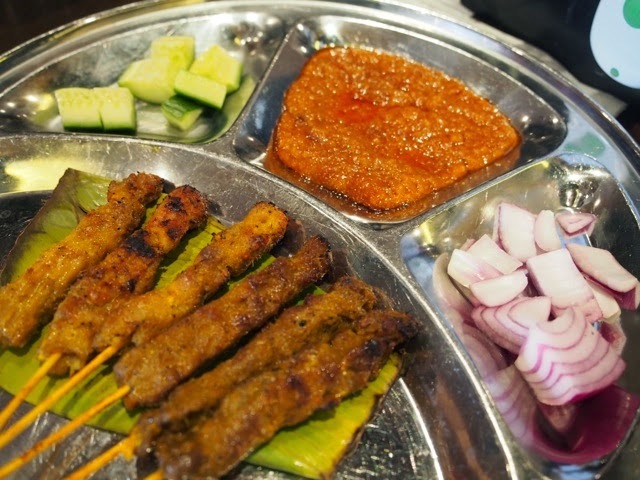 I would come back for wat tan hor, satay and their extensive drinks menu, and skip the rest. Especially the ABC.